Today’s mastering studio must be prepared for Dolby Atmos(r) and Auro 3D(r) projects. Monitoring up to 16 channels in a quality that is on par with state-of-the-art stereo was hard to achieve – until now. The new MC16 monitoring controller operates on SPL’s 120V DC audio rail and sports the world’s first 16-gang custom-designed precision potentiometer from SPL. 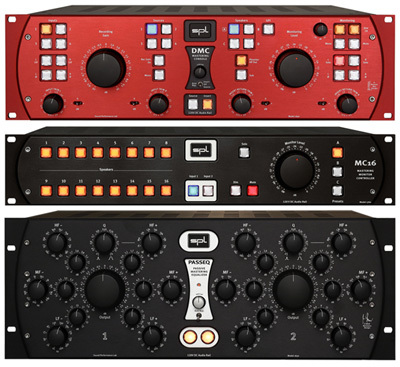 Most mastering studios use their L/R speakers (and subwoofer) for both stereo and multi-channel monitoring; to expand on that standard setup, SPL has developed a way of pairing the MC16 with their new DMC stereo mastering console for seamless integration of multi-channel monitoring with a stereo mastering environment. The combination of DMC and MC16 allows mastering studios to work in all current audio playback formats at the same quality level, all without reconnecting any speakers.